While folks in the surrounding areas are sweltering, I’ve been nestled in a cool blanket of fog–one of the “benefits” of living near the ocean. Of course, on cold, dreary days, my thoughts turn to comfort foods. 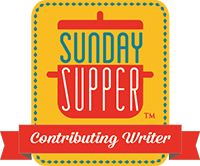 Whether that comes in the form of a piping hot bowl of split pea soup, my mom’s roasted chicken, or even a platter of enchiladas, it all depends on my mood. It had been a while since I’d made a tamale pie, and boy did that sound good. 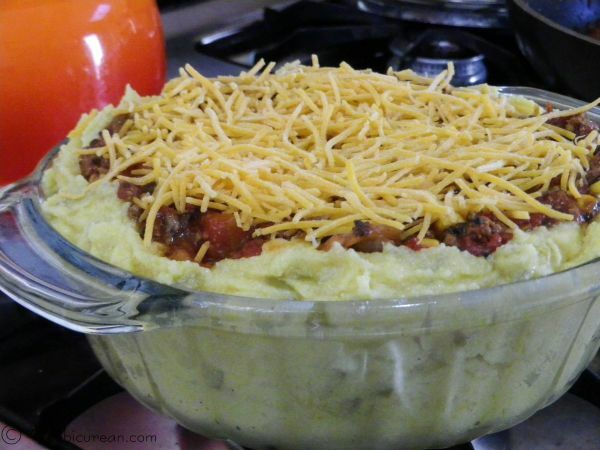 Tamale pie was a popular depression-era food that provided families a good bang for their buck, and that sentiment rings true today. 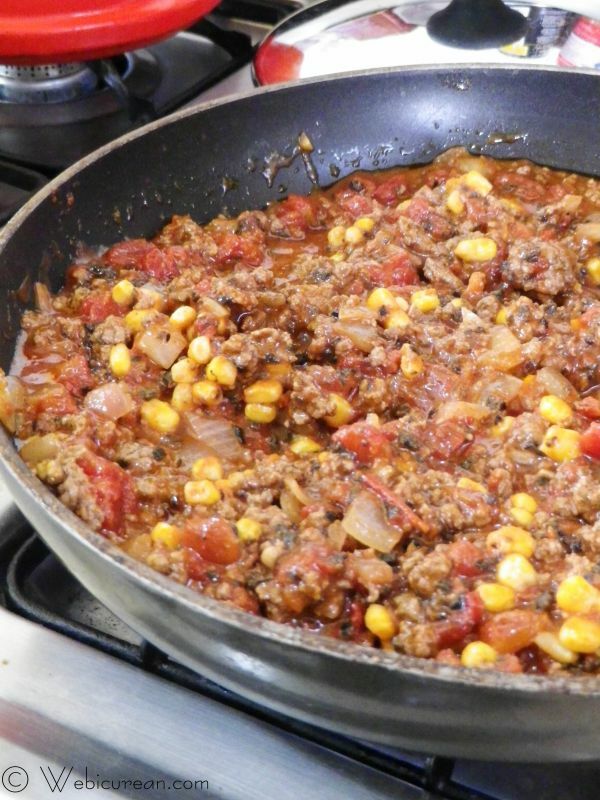 My mom often served tamale pie, so for me it’s simply comfort food. Most versions I’ve seen have a dry cornmeal crust on top. 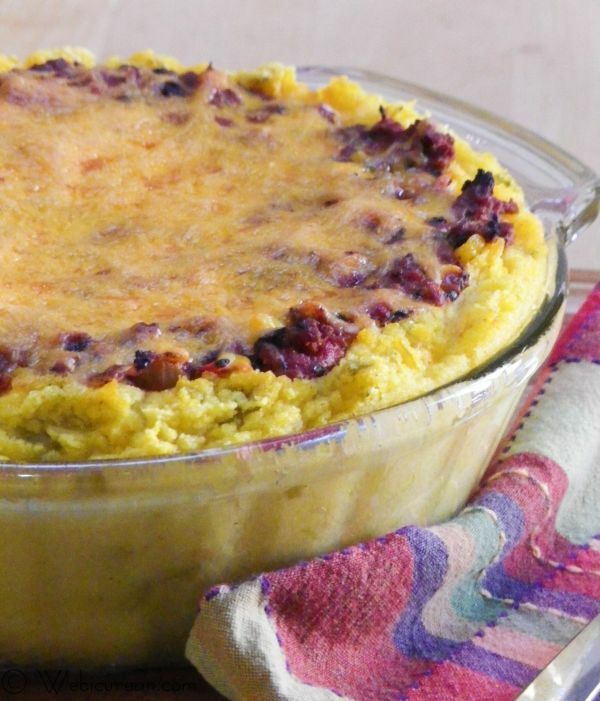 This version, which was adapted from the recipe on a box of Elam’s Yellow Corn Meal, looks more like an actual pie–the baking dish is lined with the cornmeal mixture, which remains moist yet firm. Plus, I’ve jazzed it up a bit with some diced chiles. The center is filled with the meat mixture, and I like to top it with a generous handful of shredded cheddar. 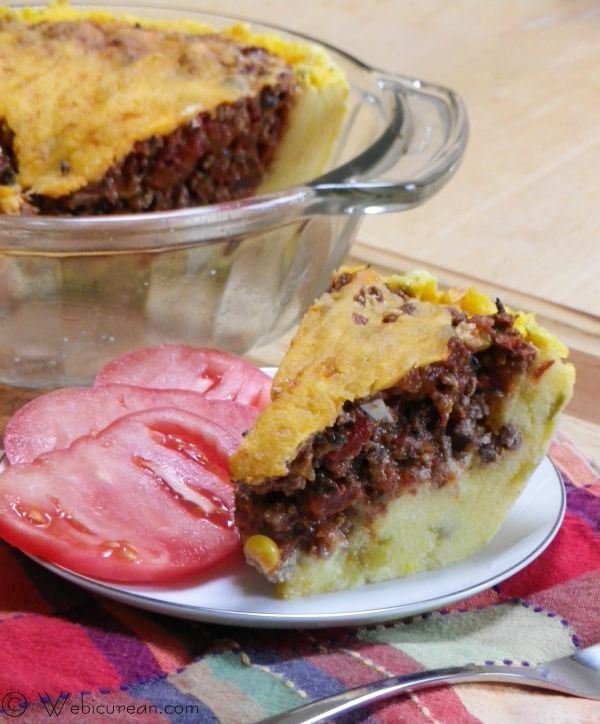 The tamale pie may not win any beauty contests, but it sure hits the spot. It’s super easy to make, and kids generally love it. Round it out with a tossed salad, and you’re good to go. 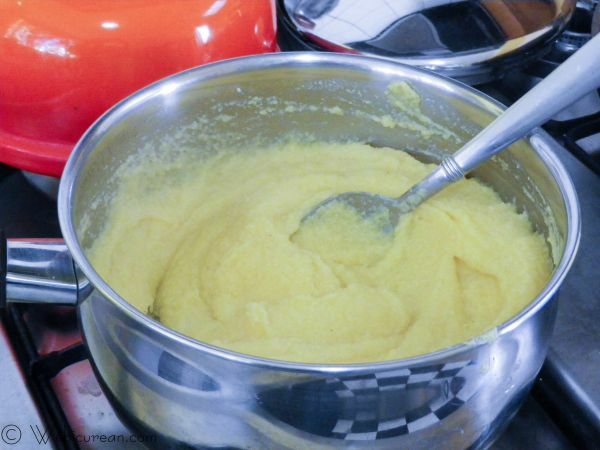 First, get the cornmeal mush ready, then use it to line a greased, 2-quart baking dish. Brown the ground beef along with the onions and garlic, breaking it up as it cooks. Once the meat is cooked, toss it with the flour and salt.Â Then stir in the remaining ingredients (except the cheese), and remove from the heat. 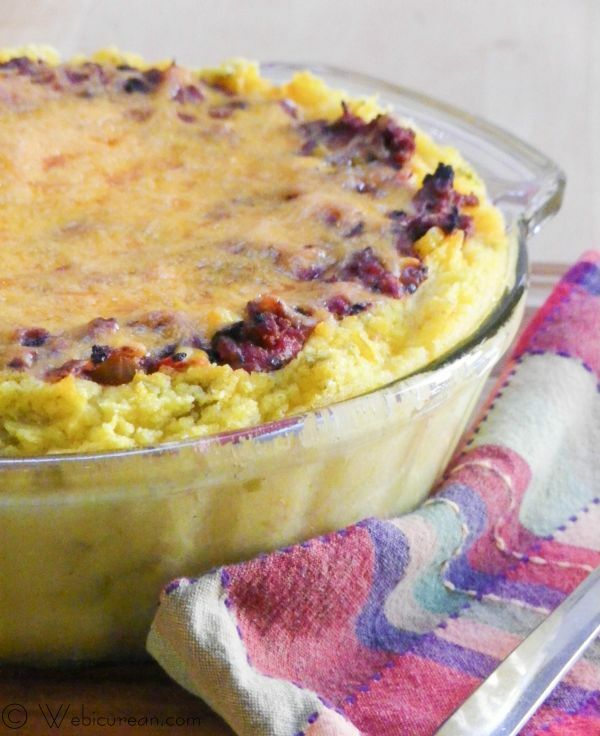 Spoon the meat mixture into the cornmeal-lined baking dish, then top with the shredded cheddar. How easy was that? 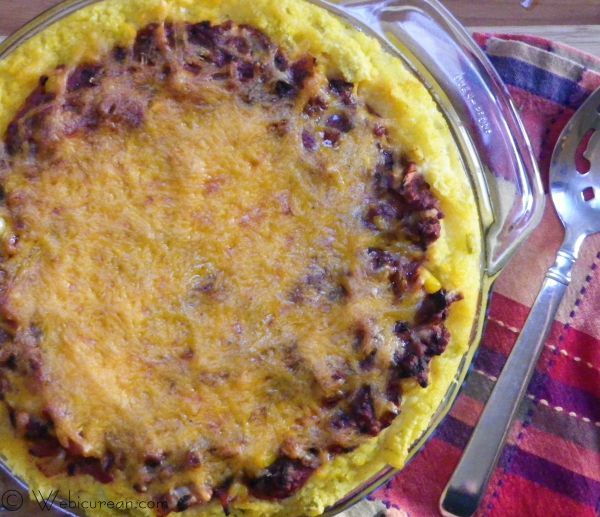 A cornmeal crust is filled with a savory meat mixture and topped with cheese in this classic tamale pie. Combine cold water and corn meal, set aside. Bring 2 cups water to a boil, add 1 teaspoon salt, then stir in the cold cornmeal mixture. Cook slowly until liquid is absorbed--about 7 minutes. Remove from heat and stir in the diced chiles. Spray a 2-quart casserole with non-stick spray, and line the sides of the dish with the cooked cornmeal. 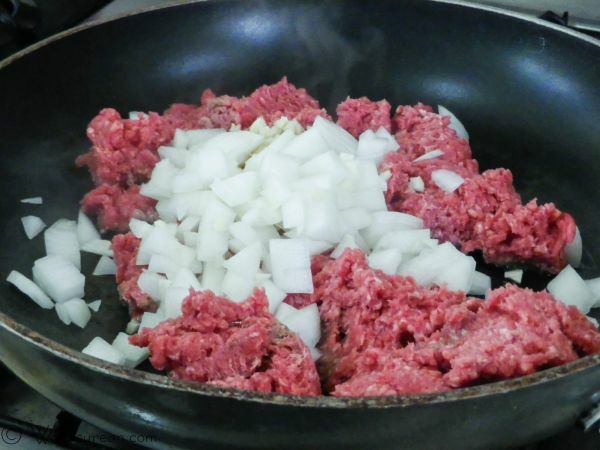 In a large frying pan, saute the ground beef, onions, and garlic over medium heat. Break up the meat as it browns. When the meat is cooked through, stir in the flour, remaining 1 teaspoon of salt, and the chili powder. Next stir in the tomatoes, tomato sauce, corn, and black olives. Remove from heat and spoon into cornmeal-lined casserole dish. Sprinkle the shredded cheddar cheese evenly over the top. Bake until hot and bubbly--about 40-45 minutes. YUM!!! I keep looking at this recipe and drooling! I will definitely have to try this! Great post! Thanks! It’s such a great weeknight meal, especially as we head into colder days! This was so yummy! I wrote a blog post about it and linked it here! Thanks for sharing this great recipe idea! You have a much richer tradition for pies in the US than we have in Norway. Maybe it is time for me to give it a try. Yah, we sure do have a thing for pies over here! This was one of my mom’s favorite weeknight meals!